Low-cost MRI Scanner | Inventing a Low-cost MRI Scanner for the Developing World Infant hydrocephalus is an abnormality that has devastating effects if untreated. Often called “water on the brain,” the malady develops when the cerebrospinal fluid that normally protects the brain increases as a result of a blockage in the normal flow of fluid to areas where it can be absorbed. Can We Turn Oranges into Apples? Infant hydrocephalus is an abnormality that has devastating effects if untreated. Often called “water on the brain,” the malady develops when the cerebrospinal fluid that normally protects the brain increases as a result of a blockage in the normal flow of fluid to areas where it can be absorbed. The increasing pressure of the fluid expands ventricles that push against the brain tissue, causing brain damage, blindness, and eventually, in many cases, death. One of the first signs of hydrocephalus in infants and young children is swelling of the head to an abnormal size. Around 400,000 infants around the world will develop hydrocephalus in any given year, and in developing countries, many of them will go untreated. Steven Schiff, MD, Ph.D., is working with engineering colleagues at Penn State to develop an inexpensive, portable magnetic resonance imaging scanner for use in developing countries to help make the diagnosis and treatment of infant hydrocephalus available and affordable in the remote regions where a majority of the untreated children live. Although the concept of an ultra-low field device has been around for over 20 years, no one has yet developed a low field scanner with a bore large enough to scan a human brain. The typical MRI found in a hospital uses a high magnetic field, typically 1.5 Tesla or higher (about 30,000 times the Earth's magnetic field). These devices require some form of very active cooling, including a bath of liquid helium and liquid nitrogen. Schiff’s device will operate at a field strength in the milliTesla range, a thousand times weaker. Because a fair amount of electricity will still be pushed through coiled copper wires, some form of air or water cooling will likely be required. But without the complexity and expense of superconducting magnets and liquid helium, Schiff believes his MRI scanner can be built for $30,000 to $50,000 and run off a marine battery or diesel generators, in some cases from the back of a truck. MRIs work by aligning hydrogen atoms within the body in an up or down direction. About half point one way and half point the other way, with a few unmatched atoms that provide the image. When the atoms are pinged with a radio frequency pulse, the unmatched atoms are forced to spin with a frequency that matches the type of tissue. When the pulse ends the atoms spin back and release energy as a radio frequency pulse of the same spin frequency. That energy provides the signal that is captured by a sensor and turned into an image on a computer. The stronger the magnetic field, the more detailed the image. “What we bring to the table at Penn State are the kinds of novel MEMS-based technologies that we are customizing to enable such devices to get to a level of signal-to-noise that has just been infeasible in the past,” Schiff remarked. Schiff is working with two engineering faculty to improve the image quality of their room temperature ultralow field system. Srinivas Tadigadapa, an electrical engineer, is working on ways to sense the magnetic fields the MRI produces. To the best of his knowledge theirs are the first MEMS magnetometers using chip technology and a nanofabrication process. Because they are small and cheap, they should be able to use multiple sensors to get resolution that will be good enough to meet the needs of surgeons in the field. “In principle, it should be possible to make a technology that is simple, effective, and easy to maintain,” Tadigadapa said. Schiff, who along with his engineering and physics appointments is also a pediatric neurosurgeon at Penn State’s Milton S. Hershey Medical Center, understands the requirements of surgeons in developing countries. He has a medical license to practice in Uganda, where there is currently only one neurosurgeon for every 10 million people, and he has done extensive field work tracking down the conditions that lead to so many cases of hydrocephalus in Sub-Saharan Africa. “Another thing we bring to the table is a lot of disease expertise for situations where scans of much lower quality than we are accustomed to can be highly diagnostic,” he said. 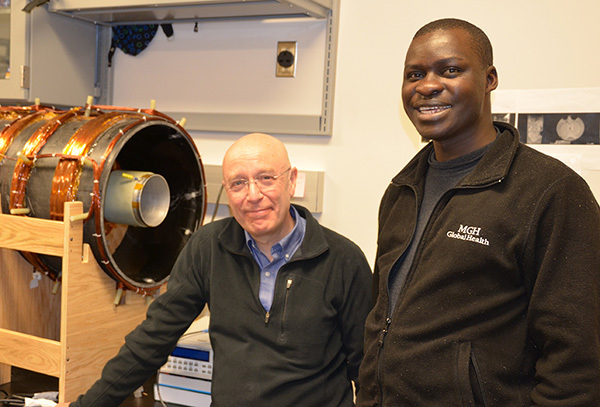 Schiff’s doctoral student, Johnes Obungoloch, is returning to Uganda to establish the Department of Biomedical Engineering at Mbarara University of Science and Technology after he receives his degree in 2016. The MRI research will continue there and other sites in Uganda where he intends to do clinical trials and evaluations of the technology. Why hasn’t anybody done this before? The idea for a practical low field MRI was proposed by a Stanford scientist named Steve Conolly in the early nineties, Tadigadapa told me. At some point, probably because the sensor technology was not well enough developed at the time, he moved on to other areas. Following Conolly’s work, a group at Los Alamos National Lab took up the challenge. They used a SQUID, a superconducting quantum interference device, which is the world’s most sensitive magnetic detector, inside a magnetic field coil. They showed they could get high contrast images, but they required liquid helium temperatures around the sensors to achieve this. This was followed up by work with atomic magnetometers at Los Alamos, a promising technology that is still not widely available. Then, in the last two to three years, Tadigadapa’s group started developing their MEMs magnetometers. Tadigadapa’s answer to why nobody has developed commercial low field MRI devices is a story of overcoming technological challenges. Schiff’s explanation is somewhat different. In clinical medicine, he told me, you need an entrance point where you can show it is a viable alternative to current technology. Can you show you can make the technology safer or cheaper? At present, with no application in clinical medicine in the U.S., there is no foothold. “We’re hoping with our collaborations with physicians at Harvard and the University of Toronto, with our combined expertise in hydrocephalus and collaborations with African hospitals, that we can show where that entry point is,” he said. A new approach to enhancing low resolution MRI comes from research on dielectric materials. Dielectrics are insulators that are widely used in electronics in the form of capacitors and actuators. Mike Lanagan, a professor of engineering science and mechanics at Penn State, has formed a startup company with two Hershey Medical Center researchers to fabricate conformable dielectric pads that can wrap around the patient’s head to enhance the magnetic signal. Lanagan believes that he can engineer the dielectric constant of the material, which will need to be increased by two to three orders of magnitude for Schiff’s device in order to be effective. The dielectric constant indicates the amount of electric charge a material can hold. The material he has in mind is called a boundary layer dielectric, and it has been studied in the Materials Research Institute for years as a material for capacitors, primarily in professor of materials science and engineering Clive Randall’s lab. However, it is more complex than just filling some kind of bag with a dielectric material. The electromagnetics need to be designed in such a way that the waves propagate through the pad and into the head. That requires good computer models of the interaction of materials and electromagnetic (EM) fields. The founding director of CURE International’s Children’s Hospital of Uganda in Mbale was Dr. Benjamin Warf, now at Harvard Medical School and Boston Children’s Hospital. It was Dr. Warf who developed the minimally-invasive, shuntless treatment for hydrocephalus that is increasingly used by surgeons when treating infants and children in Africa. It was Warf who convinced Schiff to work in Africa, and they have coauthored papers in medical journals about their successes treating infant hydrocephalus without shunts. They are presently running an NIH sponsored clinical trial in African comparing shunts versus shuntless treatment on the cognitive outcome in infants with hydrocephalus in Uganda. Shunts, the standard treatment in the U.S., are dangerous in the developing world because of the need for multiple shunt replacements as the child grows and the danger of the shunt failing after the patients return to their often distant villages. Traveling back and forth to the CURE hospital in Mbale for diagnosis is beyond the means of most subsistence Africans. Schiff’s portable MRI could help solve this problem by bringing diagnostic facilities to remote Ugandan hospitals. It was Warf, along with Schiff and a number of students and faculty from Penn State, who are unraveling the link to hydrocephalus in the blood and meningitis-type infections that infants developed in the first month of life in Uganda and other African countries, known as neonatal sepsis. If an infant survives neonatal sepsis, the damage to the lining of the brain can often result in hydrocephalus. Using DNA sequencing on bacterial remnants from the infants’ cerebrospinal fluid, and comparing it with bacteria found in the huts in the remote villages, the team determined that the local environment, such as farm animal dung used to line the walls of the huts to keep out insects and rain, may be a major source of infection. Prevention of infections by changing hygiene in the home environment may be the single best cure for the hydrocephalus epidemic. This is also an example of a project that no one could do on his own, Schiff believes. A new convergence of life sciences and physical sciences is underway that this work highlights. At the Millennium Science Complex at Penn State, engineers and materials scientists from one side of the building can work intensively with life scientists and physicians from the other side to form a working group with their students that can produce the next generation of such device technology. With their students from overseas, they can build capacity in-country in Africa to insert such cutting edge technology into both clinical and academic centers with the goal of sustainable long-lasting health benefits. Steven J. Schiff is the Brush Chair Professor of Engineering in the departments of Neurosurgery, Engineering Science and Mechanics, Physics, and Bioengineering. Contact him at sschiff@psu.edu. Michael Lanagan is professor of engineering science and mechanics. Contact him at mlanagan@psu.edu. Srinivas Tadigadapa is professor of electrical engineering. Contact him at sat10@psu.edu.